SANTA FE – The New Mexico Department of Game and Fish is reminding hunters that Wednesday, March 21, is the deadline to apply for deer, elk, pronghorn antelope, oryx, ibex, bighorn sheep, javelina and Barbary sheep licenses. The department expects more than 160,000 applicants for about 60,000 licenses. Hunters must complete their applications before 5 p.m. MDT March 21. All applicants must create an online account at onlinesales.wildlife.state.nm.us prior to applying. By phone: Hunters without computer access or who need help applying can call toll-free, (888) 248-6866 and a department representative will submit an application for them. The information center will be open until 8 p.m. Monday and Tuesday. The center will close at 4:30 p.m. Wednesday, March 21. Phone lines will be extremely busy as the deadline approaches, so applicants are encouraged to apply early and have their hunt choices ready. Applicants will be able to print 2018 nonrefundable game-hunting and game-hunting and fishing licenses from their account March 22. Draw licenses can be printed after the draw results are released April 25. Licenses are no longer mailed except by request. To be eligible for the draw, applicants who held deer, elk or turkey licenses for the 2017-18 seasons must have submitted a harvest report either online or through the information center and paid any applicable late fees by March 21. Applicants who held 2017-18 licenses for oryx, ibex, Barbary sheep, javelina and trapping must submit harvest reports by April 7. Failure to report before the deadlines will result in rejection of all draw applications. 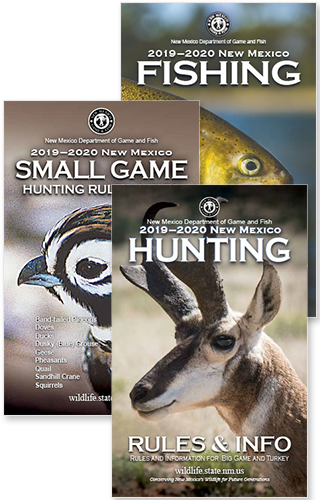 Information about rules, seasons, fees and more is available in the 2018-19 Hunting Rules & Information booklet online at www.wildlife.state.nm.us and available in print at license vendors and department offices. Hunters are encouraged to review season dates, application deadlines and other information before applying for licenses or going afield. The department website also includes valuable information about how the draw works, application procedures, game-management unit maps, drawing odds and a “How to Apply” video. Hunters this year are especially encouraged to review new rules regarding tagging their harvested game. A separate tag will be required in addition to the printed license, and all big game and turkeys must be tagged at the time of harvest. Tags will be mailed to all successful draw hunt applicants and will be available at all license vendors and department offices for over-the-counter licenses. Some restrictions may apply for online big game license purchases to accommodate mailing of tags. Complete information about the new tagging requirements is available on the department website and in the Hunting Rules & Information booklet. Read more about tagging here.